Details and specifications of Davka's DavkaWriter Platinum 6, £109-£129 (GBP inc VAT RRP £139). DavkaWriter Platinum 6 is a sophisticated Hebrew/English word processor with over 50 new features for Hebrew fully pointed with Nikud right-left Hebrew and English wordprocessing and Hebrew unicode export. Microsoft Windows XP / Vista / Windows 7 compatible. 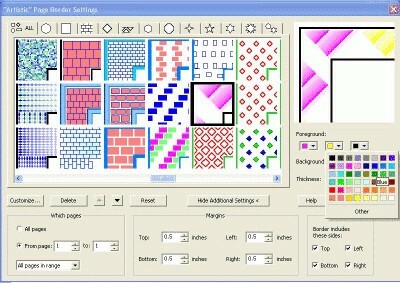 Check for latest version (DavkaWriter 7 announced May 2011) and upgrades for use on Windows Vista and 7. Buy latest version, buy version 6 or call us on 0844 808 3699. 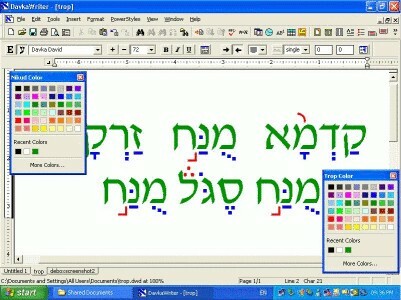 See other davka software, Hebrew software and Jewish software. 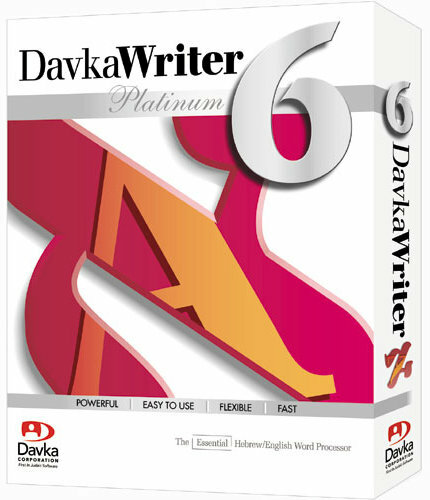 DavkaWriter Platinum 6 is a fully featured Hebrew/English word processor with advanced enhancements included as standard. It's simple to use, yet exceptionally powerful. You won't find better value in a Hebrew word processor anywhere. Built for Hebrew word processing from the ground up! Designed with the home user in mind! Pro features for creating sophisticated documents! Check spelling as you type, in Hebrew and English. Misspelled words are marked with a red squiggly line. Click the right mouse button over a misspelled word, and a menu of spelling suggestions and other options pops up. This menu includes an "Ignore All Occurrences" command, which is like the button in the spell-checking dialog. This command now takes effect for as long as the document remains open. So you won’t see that word flagged, not in your next spell-checking session, and not by the auto-spell check feature. Spell-checking now defaults to accepting all words of Tanach, and accepting both 'chaser' and 'malei' spellings. DavkaWriter’s new macro editor simplifies complex and repetitive tasks, and provides you with the ability to automate many different aspects of word processing, from simple tasks to complex processes. Some useful sample macros are provided, and users can share macros with each other for even greater productivity. You don’t have to be Einstein to use it either -- our extensive tutorials and guides will teach you all you need to know! Divide your document into chapters, each with its own title in Hebrew or English. Then, with the press of a button, create a table of contents listing all the chapters in the document, and the pages they start on. Using multiple levels, you can create a table of contents for parts, chapters, and sections. Choose from a variety of impressive styles for the table-of-contents layout, or customize your own. Instantly jump to any chapter in your document, either by clicking on the page number in the table of contents, or by using the "Go To" dialog box. Add a chapter title into your header, and it will automatically update to reflect the current chapter in your document. That way, with just one header, you can have the title of the current chapter appear correctly on every page in your document. No longer will you have to examine each header to make sure you've got it right. 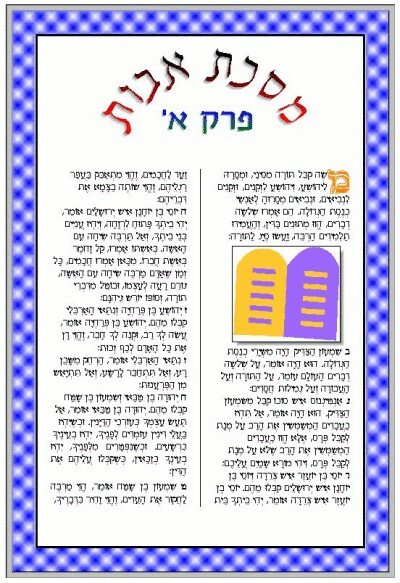 You can do this for multiple levels, so that the header of every page can contain several updating items, such as the parsha and the perek, or the chapter and the author, in addition to the page number and other text you place in the header. Would you like to lay out a whole document with several texts, each in its own section of the page, flowing from page to page, for hundreds of pages, always occupying the same spot on each page? With the new program it is easy. Just set up the positions of all your texts on the first page, using text boxes. Then, with the replicate text boxes command, DavkaWriter will reproduce those boxes for as many pages as you want, all pre-linked together. Just drop your text in and you're done! In a single step, remove many text boxes that are chained together, using the remove multiple boxes command. When you need to search one of DavkaWriter’s text libraries, such as Tanach, Mishnah or Siddur, or one of the libraries included with DavkaWriter Dimensions II or other packages, Find in Files can search the library for you. It provides a drop-down list of all text libraries installed. It’s almost like having a mini-Judaic Classics Library within DavkaWriter! A new Table Menu provides convenient access to all table commands. It also provides some new commands: Convert table to text, Insert multiple rows, Select whole cell, and Select whole table. Also, the command "Insert row" is now divided into 2 commands "Insert Row Above" and "Insert Row Below"; the command "Insert column" is now divided into 2 commands: "Insert Column To Left" and "Insert Column to Right". When TABBING through cells of a table, and you get to the end, and the TAB key creates a new row, it now moves instantly into the new row, so you needn’t hit TAB twice. Ideal for writing in scholarly journals, DavkaWriter Platinum 6 enables easy addition of a dot underneath the English letter ‘h’ to signify the Hebrew letter ‘het’. The English Thesaurus has been enhanced with 10,000 new definitions, usage examples for most words, and pronunciation guides. DavkaWriter can now copy text as unicode (both plain UTF-16 unicode text, and rtf with unicode), and export to unicode formats (UTF-16 unicode text files, and rtf with unicode). This allows sharing formatted Hebrew text in many unicode-aware programs. The New Navigate Menu is a convenient place to find all the bookmark, hyperlink, and chapter/table-of-contents commands. Plus, it adds some commands not previously available in a menu: Next Page, Previous Page, Forward, and Back. Next Page and Previous Page are good for high-speed visual scanning of a document’s contents. Forward and Back are useful when you’re following hyperlinks. When inserting an image, or opening a file, the dialog box remembers whether you viewed the files as a list, icons, small icons, details, etc.. (Only in Windows XP and later.) Also, the Browse buttons in the Hyperlink editing dialog, in the Insert-Document dialog, and in the Mail Merge dialog have this new ability. "Export to pdf" now works for booklets. New option to save files automatically as their original DavkaWriter versions. This way, you can work on files from someone with an older version of DavkaWriter, and he can still open them after you are done. It also can inform you if you’ve added a document element that is not supported by your friend’s version. Export to older DavkaWriter version now warns you if it had to omit document elements. New command "Save Selection As" enables extracting a portion of your document into a new file. User’s latest choices in the "Go To" dialog - whether to go to a page, a bookmark, or a chapter, and whether to sort bookmarks by position or name -- are now saved between program sessions. Importing of Wordperfect files now handles shin, sin, oh-vov, oo- vov, and it gets the paragraph breaks right, and it cleans up a lot of stray formatting codes, and gets other nikud right. The result is much neater and more complete. "Find/Replace" can now search for text independently of the language. Such as searching for paragraph breaks, spaces, tabs, punctuation, etc.. New option "Match All Underlines" makes text in several different fonts or sizes use underlining that is of uniform position and thickness, for a more professional looking result. Prices are in £GBP and include all applicable taxes (VAT etc). Purchases of multiple copies may be eligible for discounts of up to 40%, email us for a quote with the quantity you require.